Before the surgery opened in Essex Way in the 1950s local folk would visit Dr. Eaton’s practice in St. Mary’s Drive, Benfleet. The house was possibly called ‘Wheatlands’ and it was just two or three properties up on the left-hand side. Dr. Eaton retired in 1954, around the time that the new practice opened in Essex Way and his son, Henry, took over from him. Also at the Essex Way surgery at this time was Dr. Stephens. If anyone can help fill in the gaps and supply us with information on Dr. D. A. Eaton, we would be very grateful. The letter in the local press (right) tells us that ‘Dr. Eaton liked nothing better than to receive a call from the Winter Gardens on neighbouring Canvey. He would contentedly cross Benfleet Creek, his short, precise figure soon making stready progress among the rough tracks in a part of Canvey that still largely remains an unflurried community. There are Winter Garden inhabitants who swear by Dr. Eaton and speak of him with real affection – a testimonial in itself’ it goes on to say ‘the creekside doctor, the man who earned respect through a quiet but authoritative manner’. A TESTIMONIAL to retiring Dr. D.A. Eaton at South Benfleet, was accepted by his wife, Mrs. H. Eaton (holding bouquet) at a ceremony held at the British Legion Hall, South Benfleet, on Thursday. The doctor was unable to attend because of illness. Shaking hands with Mrs. Eaton is Counc. C. Bell, who made the presentation. 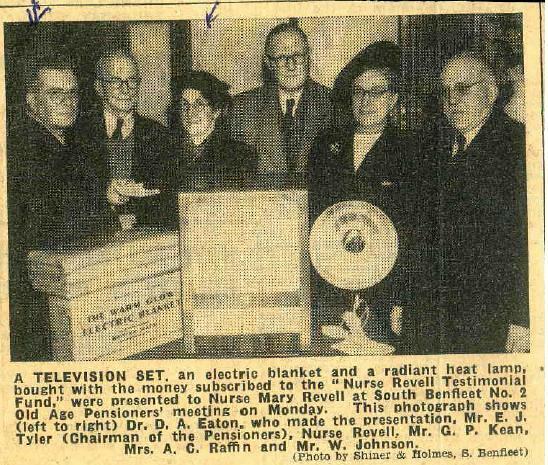 Also in the picture are Dr. & Mrs. Henry Eaton. Dr Eaton Snr brought me into the world 76 years ago! He was a lovely kind man who really knew and cared about his patients. I remember, during the floods on Canvey Island he was helping with the rescue work and was very affected by the things he saw during that time. Afterwards his wife said to my mother that she didn’t think he would ever be the same again and, sadly, he wasn’t as it was not long before he retired partly due to ill-health. 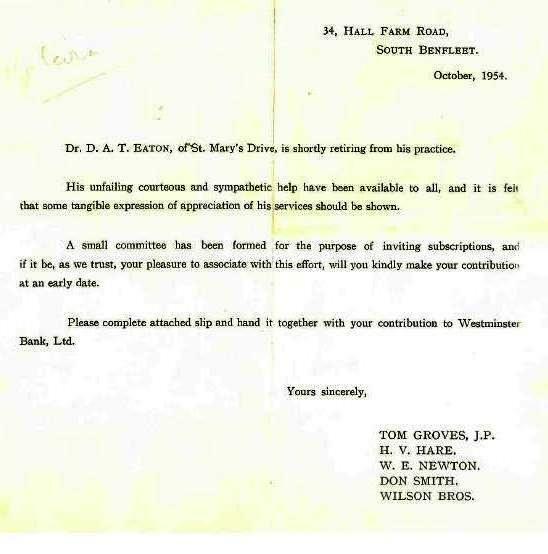 We lived in St. Mary’s Drive too but we were at the top near to what is now Norwood Drive while Dr Eaton and his family were nearer to the village. His surgery and waiting rooms were, I think, the two front rooms of his family home. They were always lovely and warm in the winter with a gas fire burning in each one. Betty. I remember Dr Eaton (old Dr Eaton as against young Dr Eaton) when, in 1954, he sent me to Southend General to have an ingrowing toenail and part of the nailbed removed. He advised me to wear Wellington boots for the bus journey as I would be unable to refit normal shoes after the operation. A week later I reported back to his surgery, in fear, to have the dressing removed which had developed into a congealed mess. However he summoned his wife who took me into the kitchen and soaked the dressing in a bowl of hot water until it floated off by itself. In 1932 Dr Christmas was the doctor before Dr Eaton in St Mary’s Drive (I think) and he delivered me in 1932. 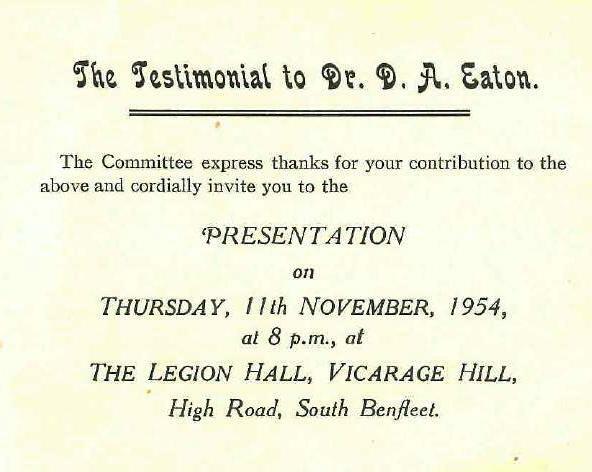 I’m sure I remember going to see Dr Eaton (the younger) when I was a child and we lived in Highcliff Road. I remember thinking he was very nice. I think he went to Canada. I’m sure I recall the surgery waiting room was very quiet, with a big, red painted fireplace and stuffed animals and birds. Sure someone will put me right! I was very interested to see this page on Dr A Eaton and his son. 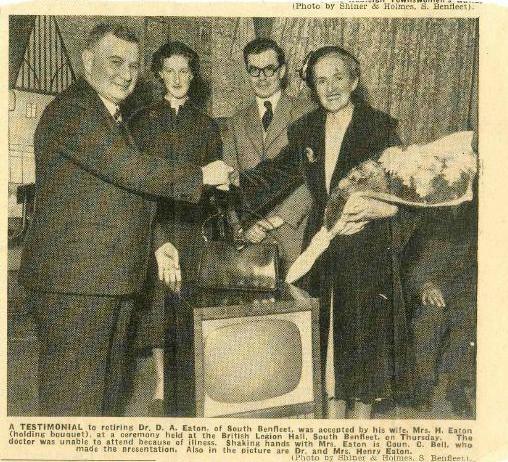 I was assisted into the world by Dr A Eaton and Nurse Revell at my grandparent’s house in Essex Way in 1949. Coincidentally my grandfather, Walter Johnson, appears in the photograph of Nurse Revell’s presentation. I do dimly recall attending Dr Eaton’s surgery in St Mary’s Drive to be vaccinated against smallpox, presumably just before his retirement.